I love the elegance of the Art Deco era of the Twenties and Thirties. Of course my mother points out that I would have probably been at the back of a bread line dressed in rags, but I prefer to picture myself draped in chiffon and pearls, languidly smoking from a long cigarette holder and lounging in a posh Park Avenue mansion. Thanks to Prem Kahani, that vision has been altered slightly to one of gold-edged sarees and cocktail shakers; a quartet of musicians playing in my Marine Drive home as friends and I rehearse for a benefit we’re holding for the poor and needy (the people actually standing in that bread line of Mom’s). But I am getting ahead of myself. It’s Labor Day here in the US and Canada, and let me tell you something: I have really labored for you guys. 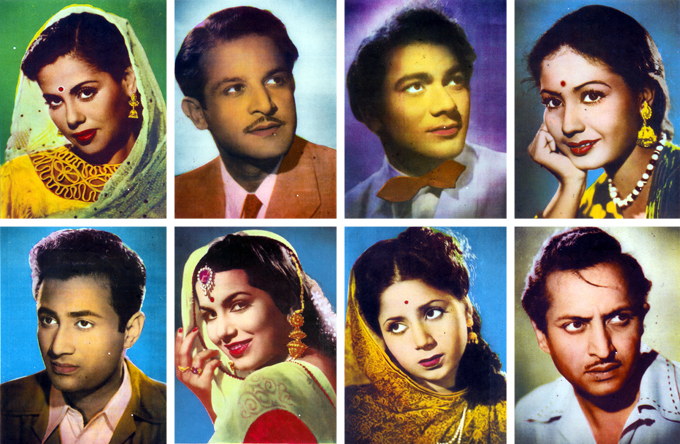 I recently got my hands on a very fragile and worn copy of Baburao and Sushila Rani Patel’s 1952 book called “Stars of the Indian Screen.” It features 36 actors and actresses, with a short biography of each accompanied by a gorgeous colored plate like the ones above. And though the book is credited as written by Sushila Rani Patel and edited by Baburao, the bios have Baburao’s trademark snark all over them, by which I mean they are awesome. I love you, Kismet. I can see why, for 32 years until Sholay, you held the record for longest run at the box office. I love your story, I love ten-year-old Mehmood, I love VH Desai (whom Saadat Hasan Manto called “God’s Clown”), I simply adore Ashok Kumar in all his youthful kind-hearted con-man glory. I love your unwed pregnant girl, your runaway son; I even love your songs, which is sometimes hard for me with movies as aged as you are. I can’t wait to see you with subtitles (thanks Raja!) 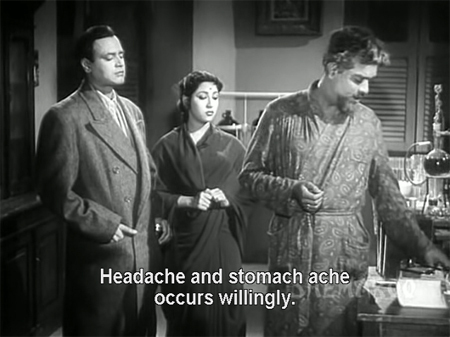 but even without them you are enthralling, you dear old progressive masala template of a film, you. Anybody who comes here regularly will not be surprised that I could not resist a film called Big Pigeon. And I’m so glad I didn’t—it is oodles of fun, with a talented ensemble cast, nice RD Burman songs, and lots of laughs. And *wow* I love Rehana Sultan. What a shame she got pigeon-holed (yes pun intended, my bad) and her career fizzled. Deven Verma wrote, produced, directed and starred in this comic crime caper; the internet appears to believe that Amitabh Bachchan and Helen star in it, but Helen has just one cabaret dance and Amitabh is nowhere to be seen (nor is he credited, as imdb claims). It’s possible that he had an uncredited guest appearance but if so, it’s gone. I didn’t miss him: Ashok Kumar, Leela Mishra, Rehana Sultan, Deven Verma, Pinchoo Kapoor and a little butterball toddler billed as “Golu (A Wonder Child)” kept me enthralled and in stitches. This movie is a real treat despite its occasionally heavy-handed preaching (and at least it is preaching I can agree with!). First, it has lovely music by Ravi with lyrics by Sahir Ludhianvi (including one of my first favorite Hindi film songs, the Rafi classic “Yeh Wadiyan Yeh Fizayen”); second, it has a young and *very sparkly* Tanuja; and third, it is set against an historic backdrop —the annexation of individual princely states by the new Indian government. It’s a film typical of star Sunil Dutt in its idealism and progressive message, and if Nanda is a little weepy for my taste in it she is balanced out by Tanuja. Ashok Kumar is the Maharajah their father, a strict and conservative man who is determined to keep his kingdom and privileged lifestyle intact. Somehow the internet got the idea that Raaj Kumar is in it too, but he is nowhere to be seen although someone named Rajkumar appears in the lesser credits. Even though I have already watched an Eighties film this year, I decided to risk another since this looked basically harmless and kind of fluffy. And indeed it mostly does resemble a stuffed animal: cute on the outside (Vinod Khanna in mechanics’ overalls, Reena Roy in bright sarees, Ashok Kumar as a kindly benefactor) and comfortably squishy on the inside (story elements we’ve seen a gazillion times before). Even villain Amjad Khan is too well-fed and portly to seem threatening. It’s Bhappi Sonie at the helm, after all: he’s generally benign. Until the end, when a woman’s honor is deemed more important than her happiness or her safety. Sigh. And Nirupa Roy turns on all the waterworks because she has ruined her own life, although naturally she blames fate and not herself. Sigh again. But I don’t expect much else from the era, and up to that point there is fun—and plenty of eye candy—to be had. 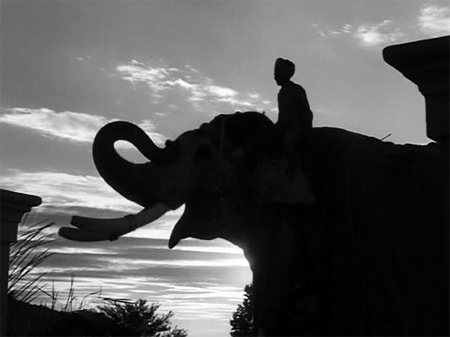 My father began his career in films with Mala Sinha and Abhi Bhattacharya. Abhi Bhattacharya was a very nice man: in fact, a thorough gentleman. He had an interesting trait. He had the ability to fall asleep anytime, almost anywhere and under any circumstances. Once dad observed that Bhattacharya wanted to take a nap but could not find a pillow; finding a brick instead, he just went ahead and laid his head on the brick and instantly fell asleep. Dad shared a warm relationship with him and they acted together in a number of films. Here, daughter Shilpi reveals the real man behind the villains Tarun Bose played so convincingly! The soft-hearted villain: that is what I call dad, soft-hearted being the literal translation of the Hindi ‘Naram Dil’. He was a very affectionate man; he bestowed fatherly affection on everybody without discrimination. I once asked him, “What kind of role do you like playing the most?” “The villain; a villain’s role provides you with a greater scope to perform”, he said. But given his nature, it was not surprising that although he loved playing the villain, he hated roughing up his female co-stars or any of the child actors. Ah, what a film this is. If you have a hankering for something that careens wildly along, going from completely loony, to sweetly touching, to dumb and illogical, and back to loony again, look no further. I wouldn’t call it technically a good film, but it is highly entertaining. And I loved it! With features like Excellent Use of Helen, a zealous and melodramatic murderer named Snaky, a disfiguring cake, useful little white mice, lost and found family members, fantabulous songs (Azad in blackface! 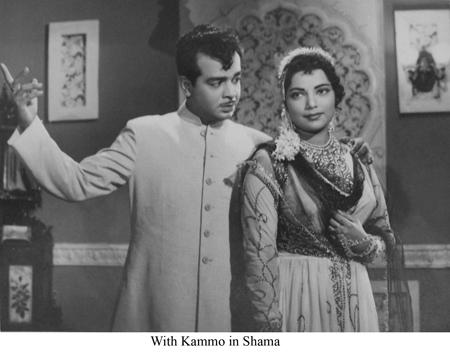 ), plus Memsaab favorites Ashok Kumar and Rehman as friends-turned-bitter-foes, how could I not? I have been longing to see this with subtitles, but didn’t think it was available except on an unsubtitled (and unplayable after ten minutes) VCD. Many thanks to Tom D (the most banned-from-YouTube-person-on-earth) (my opinion only, not backed up by anything resembling actual facts) (but still: I think it’s because he does what Indian DVD manufacturers can’t be bothered to do, which is to clean up the picture and sound quality, remove their intrusive and gaudy logos, and add subtitles, thereby making them look bad—as they deserve to—so they complain and he gets suspended, over and over again). Anyway, thank you my friend! for supplying me with this particular ginormous rock of crack.